But before talking more about the shape I need to say a word about the name. Like the name of another of my favorite Peterson shapes, the Oom-Paul (or Hungarian, to historical revisionists), the name of the Kaffir shape carries a heavy negative racial freight. In using both words I believe it is important to stop and think about their use and to recognize the full extent of their meaning. I know a pipe-smoker who refuses to smoke an Oom-Paul because of the association of its name with “Oom-Paul” (Uncle Paul) Kruger, and I understand his reason for doing so. Yet the shape did not originate with Kruger; he merely smoked it. In point of fact, Charles Peterson was manufacturing it before Kruger was smoking it. To remove the names of these shapes from the pipe lexicon, like removing the names from history, only buries the truth. For my part, I believe it is better to smoke these shapes in full recognition of the crimes associated with their names, but to do so with humility and a determination to use them as reminders to create peace within ourselves and whenever necessary to be upstanders, and not bystanders, in our communities. The Kaffir shape is often confused with shape 268, which Peterson called a “Bent Albert” in its 1947 Shape Chart. The 268, which made its first appearance in the K&P ephemera in the 1937 catalog, has an oval (rather than round) shank and squarish (rather than tapered) bowl. Nowadays the 268 is usually called a Zulu, although in the 1970s and 80s it was just as frequently known as a Woodstock, Yacht or Yachtsman. To my eye, the 268 looks like a classic English derivation of the stronger Kaffir shape. 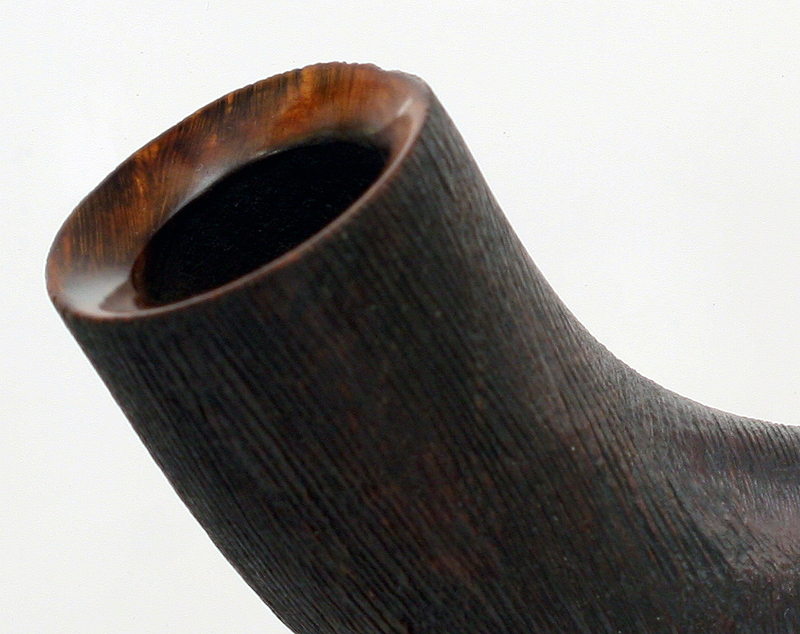 The Kaffir shape, which is known these days as a Horn or, in its more robust renditions, an Oliphant, derives from one of the earliest tobacco pipe shapes on record. My co-author Gary Malmberg calls shapes like this “tube pipes,” which are essentially graduated tubes with upturned chambers to prevent the tobacco from spilling out. 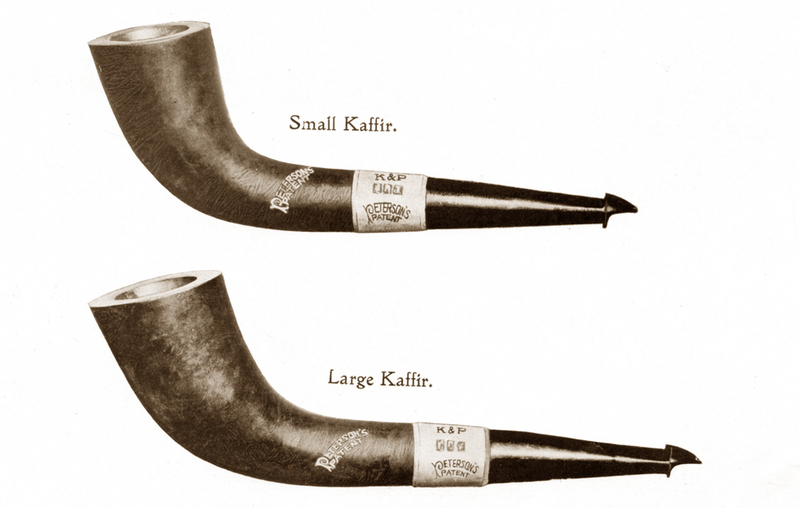 As etymologists know, “kaffir” is originally an Arabic word meaning “heathen” in the sense of “non-believer.” How the word came to be associated with the shape is something shrouded in the mists of early pipe lore, but it is interesting to ponder the exotic associations this as well as Oliphant and Horn conjure. Peterson’s first reinterpretation of this beautiful shape reappeared quite briefly in the shape chart around 1979, with the “Shape 04 Kaffir,” which was produced in a smooth brown matt finish and a black brush rustic finish, the latter with a smooth “easy-loader” style rim. This wonderful rustication process also used on the Army Classic Lines pipes at the time. The 1979 shape doesn’t actually reproduce that of the 1905 pipe: it is much heavier at the bowl’s foot, lacking the graceful upward sweep of the earlier pipe. The late 70s and early 80s were also the low-water mark for Peterson’s use of sterling and nickel mountings, so no surprises in the choice to forgo the ferrule. Giving the stem an 1/8th bend was also something very much of its day: while post-modernity was slipping in, the idea of historical accuracy in reproducing anything—whether Bach or the latest costume drama from Hollywood—was still something rather new. 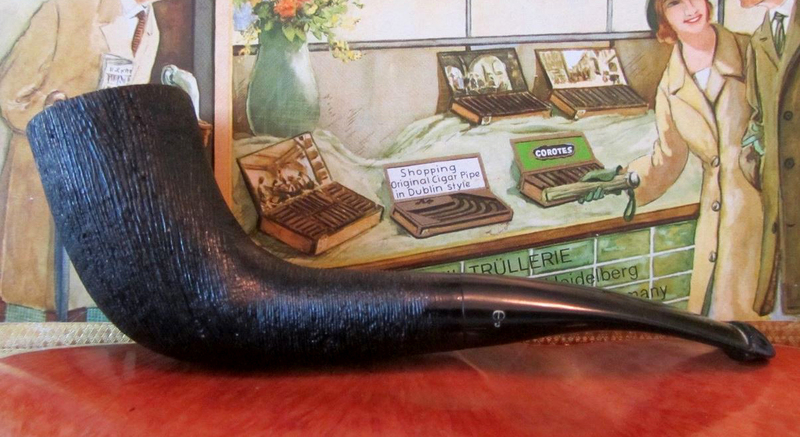 The shape then disappeared until resurfacing as part of 2009’s Antique Collection, perhaps spurred on by requests from Peterson collectors like the late Chuck Wright and myself. The shapes and dimensions are nearly identical to the 1979, with a slightly longer shank and shallower chamber in the earlier version. The wide sterling band gives it great visual interest. While not as deeply bent as the 1979, the 2009 was also given a slight bend, but even had it been straight it would not reproduce the almost boomerang curve of the large 1905 Kaffir. 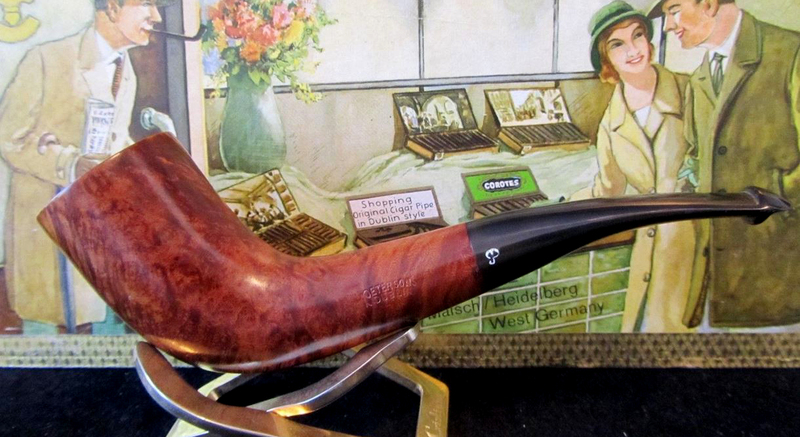 The 2009 Antique Collection shape proved to be extremely popular and so entered into the B shape catalog as the B35. It has since appeared in a number of annual lines, including the 2013 St. Patrick’s Day, the 2013 Christmas Pipe, the new 2014 Christmas Pipe lineup, as well as the Italian-market Rock of Cashel. I can only report on the smoking qualities of my 2009 Antique Collection, which I had fitted with a P-Lip to more closely resemble the original, and it’s been excellent. The chamber seems to be V-shaped like those on my Sherlock Holmes Hansom, B10 Rosslare and old-style XL75 Dunmore. Is it my imagination, or does this chamber geometry burn better than a traditional U-shaped chamber? In any case, they all seem to facilitate very few relights, burning to the bottom whatever Virginia flake I choose to smoke in them. *The Peterson Museum holds a very rare, cased and amber-stemmed Kaffir, hallmarked 1897, with a unique Charles Peterson patent mouthpiece, the NAP, which will be depicted in our book. Chamber Depth: 1.68 in /42.77 mm. Chamber Diameter: 0.76 in / 19.30 mm. Outside Diameter: 1.35 in / 34.30 mm. Update 10/23/2014: My thanks to George Fachner, on ebay as Tinashobby, for permission to reproduce photos of the the 04 he recently auctioned. George seems to find some of the most interesting Peterson estates around and his site is well worth following! This is crazy!!!! Racial undertones in pipes!!! SO WHAT!!! This crap in the USA has to stop!!! I like a Oom Paul, and a Zulu or a Rhodesian, and…….will continue to call them that!!! If one does not like it, don’t smoke a pipe, get over it, or go live with the activists. Would really like to know what Paul Kruger did wrong in your eyes? He was one of the greatest freedom fighters ever! Piet, I just bought the Mandela-endorsed biography so I could better inform myself for the book we’re writing. I think Americans (like me) simply don’t know their South African history, nor do they understand the difficulties involved in the Transvaal at that crucial moment in its history. From what I’ve read so far, Kruger was not only an incredible freedom fighter, but a fearless soldier and a consummate statesman–some amazing stuff here. I would like to correct the “political correctness” misinformation concerning Kruger for the pipe-smoking community here in the U.S. I agree. Paul Kruger was the greatest freedom fighter in South African history. Today’s presidents in our country could learn from him. Back to pipes. I will definitely keep calling it Oom Paul, Rhodesian and Zulu etc. Kaffir is a negative word, let’s be honest. But if Peterson marketed it as Kaffir in 19voetsek then so be it, it was applicable to that time. Shaun, I find it almost unbelievable that in all the materials on Kruger I have been able to source, I can’t find him talking about his pipes, or his biographers talking about his pipe-smoking. I have a great sidebar in the book about him and his importance for K&P. If you or any of the pipemen in South Africa can help us, let me know.